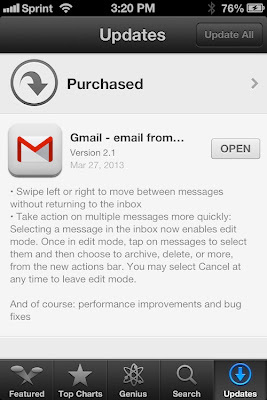 Yesterday, Google released and update for their popular Gmail app for iOS. The updated email client now allows you to swipe left and right while reading messages to move to the next or previous message. Additionally, once you select one message in your mailbox, a new "edit" menu appears at the top of the screen giving you quick access to archive, delete, or more options. 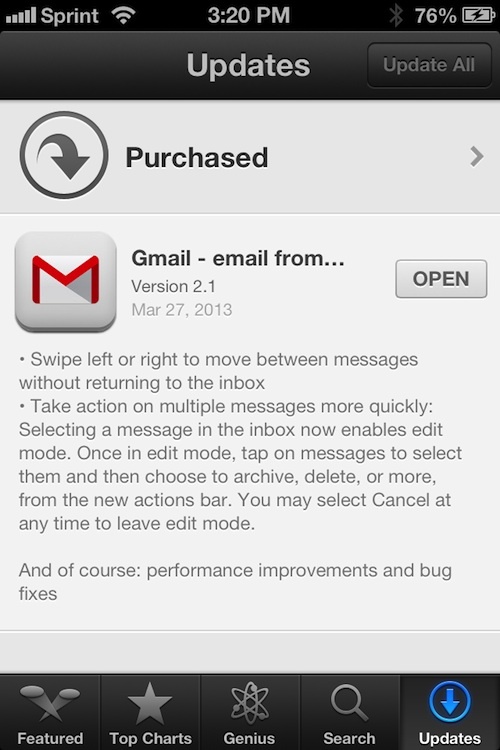 If you are a Gmail user with an iPhone, iPad, or iPod touch, you will want to install this new version of the app. The ability to apply Gmail tags to messages from my iPhone is the one features that I wish Apple's stock mail app had. But there is one other reason that you will want to consider installing the Gmail app for iOS if you use Gmail heavily, Google is gradually dropping support for "push" email notifications. In the future, the only way to get push Gmail notifications of new messages is to switch to the Gmail app for iOS or switch to an Android smartphone.